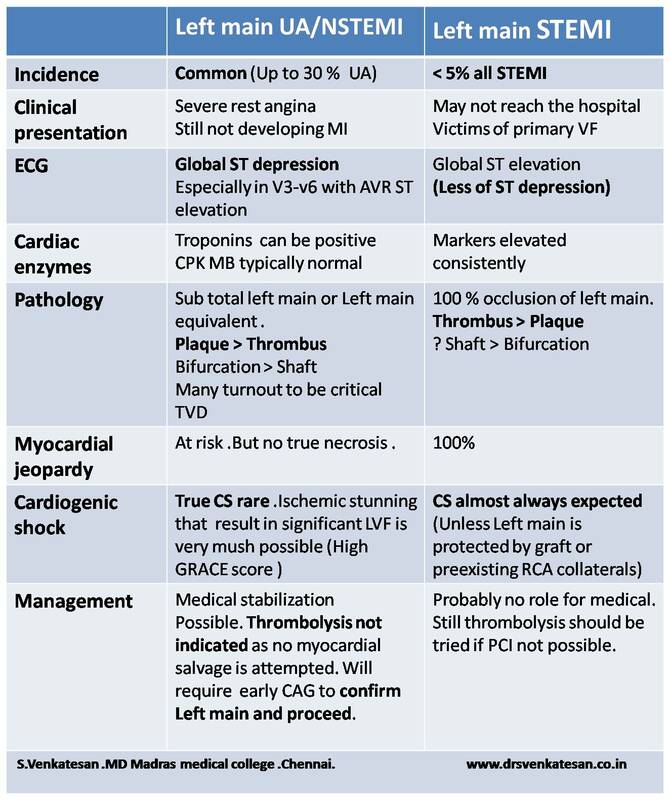 Left main STEMI vs NSTEMI : They are indeed different ! Last week there was a heated debate in our CCU regarding thrombolysis for a patient with severe rest angina and ST elevation in AVR and ST depression in V2-V5 as it implies Left main disease Few argued left main disease is an exception where one can thrombolyse even with unstable angina ! Such patients with suspected LMD are to be rushed to cath lab . . . agreed . If it is not feasible , manage it as high risk unstable angina and do not thrombolyse .Let it be left main disease . Indications for lysis are clear. ST elevation in AVR alone can not be taken as an Indication for lysis.For thromolysis to be effective there should be high thrombus burden with total occlusion . ST elevation in single lead (AVR ) is not a good marker for left-main thrombus !